Skunks can accurately direct the spray of their musk up to 10 feet away, with some of the spray reaching almost 20 feet. Skunks warn that they are about to spray by stamping their front feet and raising their tail with the fur fully extended. Mix 1 quart 3% hydrogen peroxide solution, 1⁄4 cup baking soda, and 1 teaspoon liquid soap. Do not add water. This solution can be used to wash skin, clothes, or pets that have been sprayed by skunks. Due to the peroxide, the solution may discolor cloth or lighten the fur of pets. Do not use the solution on the pet’s face near their eyes. Skunks eat a variety of insects and other garden pests. Skunks are one of the most easily identified mammals in Illinois. They are the size of a small house cat, averaging 22 to 26 inches in total length and weighing 3 to 12 pounds. In Illinois, males average 6 pounds and females 4 ½ pounds. They have black fur, small, pointed faces and bushy tails. They have 5 toes on each foot, and the front feet have long claws for digging. Their most distinguished characteristic is the two white stripes extending back from a patch of white fur on the top of their head. On some individuals the stripes do not extend all the way down the back or may be absent completely. Skunks usually have a small white streak extending from just above the nose to the forehead. 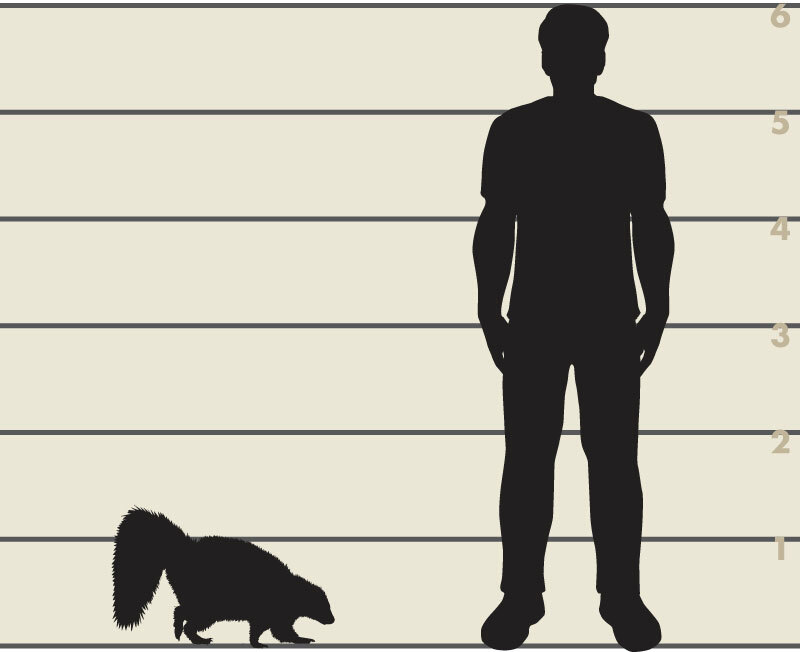 Size comparison of a six-foot tall man and a striped skunk. 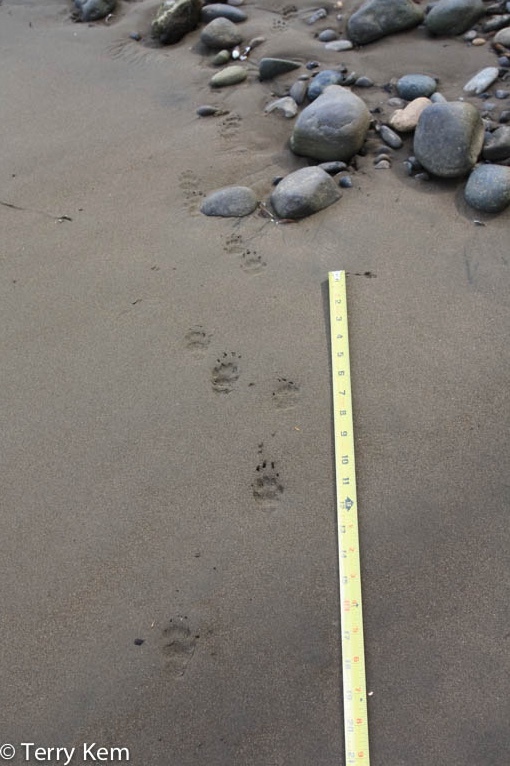 Striped skunk tracks in sand. Note the claw marks of the front feet register a distance from the paw pad. Skunk tracks look somewhat similar to cat tracks, but skunks have five toes, and cats have four toes. Another way to distinguish between the two species are the claw marks. Cat claws are retractable and do not show in their tracks. The claw marks of skunks are usually present. They will be longer on the tracks of the front feet than on the longer hind feet. Skunk droppings look similar to cat droppings but may contain undigested insect parts, berry seeds, fur or feathers. The ends of the droppings are often blunt. Skunks are common in Illinois and can be found in every county. Skunks are nocturnal and are seen most often at dusk and early morning. They do not hibernate, but may sleep for extended periods during the winter. While they are typically solitary animals they are sometimes found in communal dens. They are typically docile and prefer to avoid conflict. Skunks are well known for their method of defense. They have scent glands that produce a musk of butyl mercaptan, a strong, sulfur-smelling odor. When threatened, the skunk will raise its tail and stamp its front feet. If the predator does not back away, the skunk quickly twists its body into a U-shape and sprays the attacker. 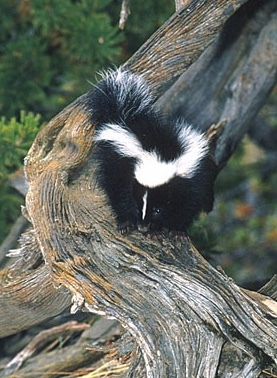 Skunks can be carriers of rabies. Possible signs that a skunk is infected with the disease include loss of fear of people, uncoordinated movements or seizures. If you suspect a skunk has rabies, call the county animal control office to remove the skunk. Skunks are habitat generalists. They are found along habitat edges near a source of water. Skunks may be found near woodlands, along fence rows, in agricultural areas, and in urban environments such as lawns, cemeteries and golf courses. They use abandoned woodchuck, muskrat, fox or badger burrows, but often rest above ground during the warmer months. They also will use stumps, buildings, or rock or brush piles as den sites. This striped skunk caught a vole. Summer home ranges of 83 to 1860 acres have been reported for skunks in Illinois. Winter home ranges tend to be smaller than summer home ranges since skunks typically stay close to their den. The size of a skunk’s home range will vary based on the amount of food and shelter available in the area. Skunks are omnivores (eat plant and animal material). They prefer to eat insects, particularly grasshoppers, beetles and crickets. They also eat grubs and other insect larvae as well as bees and wasps. When the opportunity arises, they will take mice, rats, moles, shrews, young ground squirrels and rabbits, nesting birds, nestlings, and bird or snake eggs. Skunks also eat corn, berries, and other vegetation. In an urban environment, they may eat garbage or pet food that has been left outside. 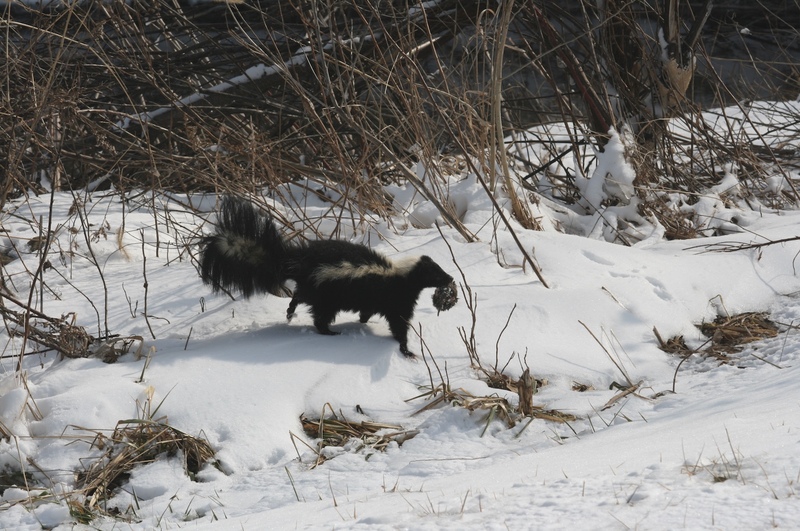 Skunks are polygamous and mate between mid-February to mid-March. Gestation is 62 to 66 days. The female has one litter of four to eight young in May or early June. The newborn young have developed fur by their second week, and their eyes open around 3 ½ weeks of age. Young begin to venture out on hunting expeditions with the female at seven weeks and are fully weaned by the time they are two months old. The female cares for the young alone. In the fall, young skunks disperse to find their own territories. Skunks may burrow under buildings, raid garbage, dig holes in lawns while hunting for grubs especially in the late summer/early fall, and sometimes raid poultry pens or bee hives. Secure garbage cans and close dumpster lids at night. Do not leave pet food outdoors at night. Remove brush or wood piles. Seal off all openings along the foundation to keep skunks from burrowing under buildings. Be sure that the skunk is not still inside when the opening is sealed. To be sure the animal is out, loosely stuff newspaper into the openings during the morning or afternoon when the skunk may be asleep inside. If the newspaper was not moved overnight after a couple of days, it is safe to proceed with repairs and to close off the access points. Openings should not be sealed if young are present. Openings can be sealed with wire mesh, sheet metal or concrete. Skunks also sometimes get trapped in window wells. Use a window well cover to keep skunks from falling into the window well. If a skunk falls in a window well, staple a towel to a board and place the board into the window well at an angle so that the skunk can crawl out. Fences can be used to keep skunks out of your property or to protect small areas such as gardens or chicken coops. 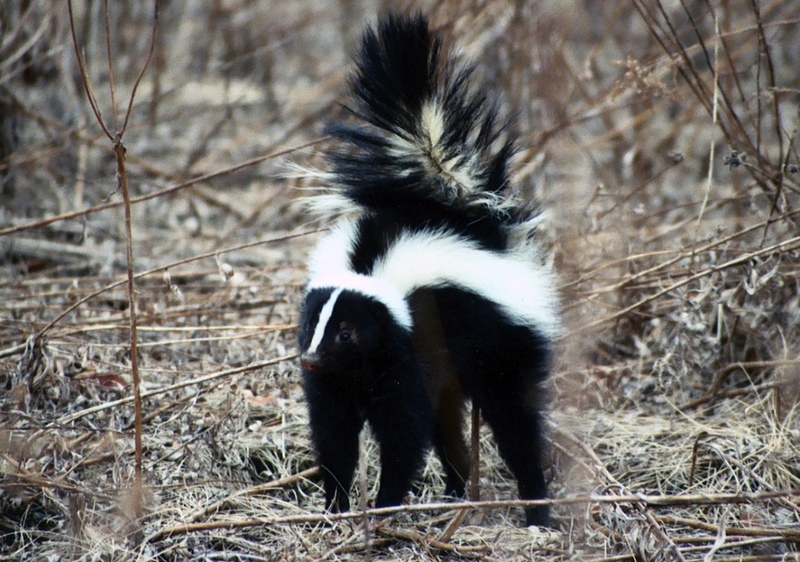 There are currently no registered repellents for skunks in Illinois. Frightening devices such as strobe lights or radios placed at the burrow are typically not very effective, but do work in some cases. If habitat modifications and exclusion methods fail to remedy the problem it may be necessary to remove the skunk. If you wish to have someone trap and remove the skunk you can hire a nuisance wildlife control operator. If you wish to handle the situation yourself, you will need to request a PERMIT from an Illinois Department of Natural Resources district wildlife biologist before removing the skunk. The biologist can provide information on options for resolving problems, including issuance of a nuisance animal removal permit. Current hunting and trapping seasons can be found in the Illinois Hunting and Trapping Digest or in the Legal Status section below. Recreational fur-trapping (and hunting when/where allowed) is the preferred method to deal with nuisance furbearer issues. Trapping can help control the local population of animals and, in some cases, reduce the number of nuisance complaints and the damage that some species can cause. The Illinois Department of Natural Resources offers a lengthy trapping season (3 months, in some cases 4.5 months). Legal trapping can occur 100 yards from an occupied dwelling without permission of the occupants, closer with permission as long as there are no municipal ordinances that prohibit trapping. In Illinois, skunks are protected as Furbearers. In urban areas, skunks may be removed if an animal removal PERMIT is issued by an IDNR district wildlife biologist. In rural areas, a hunting or trapping license is needed to harvest a skunk. Skunks may be hunted year round with no limit to the number that can be taken by licensed hunters. Skunks may be trapped from mid-November through mid-February. There is no limit to the number of skunks an individual with a trapping license may take during season. For full hunting and trapping regulations, visit the IDNR Licenses & Hunting website.